NEW AND IMPROVED DESIGN! Now with silicone handle instead of glass for more durability. Catamount Glass Microwave Popcorn Popper is the tasty, economical, and healthy alternative to microwave popcorn bags. With Catamount's Microwave Popcorn Popper, making healthy and delicious popcorn is simple. Pour your kernels of choice into the 2.5 quart container, place your desired amount of butter on the silicone melting lid, and microwave for 2 minutes and 45 seconds. As the butter melts, it will drip through the lid and evenly coat the kernels as they pop. The Microwave Popcorn Popper is made from borosilicate (laboratory glass) and is dishwasher safe. New silicone handle stays cool for easy transfer to bowls. I like this corn popper, you just have one thing to wash; its a nice size foe two people, and you don't have to use a lot of butter to get a good flaver without being oily. The only thing bad is that it does not pop all the kernals, and I always purchase organic popcorn, which is expensive to waste. The handle gets hot where it is attached, you have to use a pot holder, and I pick it up with both hands on each side. All said I would still purchase this popper. This is the BEST way to make popped corn! For a vegan, bagged popcorn was always suspicious to me. And why eat all those preservatives then throw one more unnecessary piece of trash away? All around, I only used bagged microwave popcorn for the convenience. And this is even easier -- and a lot tastier and cheaper. I put Earth Balance in the lid and then sprinkle the whole bowlful with nutritional yeast and sea salt. It tastes like slightly cheesy buttered popcorn. Sublime! I would also like to report that my 80-pound mixed breed dog also loves it. This surprised me. She would never touch the bagged popcorn -- even with nutritional yeast on top. I wonder just what is in bagged microwave popcorn she hates? So we get to share a bowl while watching Rachel Maddow. I do agree that the handle could be more sturdy. I'm thinking of getting these for my family this Christmas (6 households) -- and a sturdier handle would certainly seal the deal. I ordered 3 of these (one for each of my adult children and their families)...now I'm in the process of ordering for gifts....wonderful, wonderful, wonderful!! I absolutely love this popper. The popcorn taste so much better than regular microwave popcorn and it is healthier too. I love my new glass popcorn popper. It's also a better feeling knowing it's not a plastic product. Healthier for me and the environment. I love this popcorn popper! I love this popcorn popper! It works perfectly and has been really reliable so far. My kids want popcorn every night so it's definitely getting a workout. I love this popcorn popper. I love this popcorn popper. It's so much better than the bagged microwave popcorn. I don't use the butter melter, though, because it melts the butter too soon -- butter needs 30 seconds or less, not 2 minutes or more. I have only used the glass popcorn popper twice. The 1st time I was not real pleased, but the 2nd time I added a bit more time to the cooking & used a bit more butter. Popcorn was fantastic. I think all new things take a bit of practice to make perfect. I do feel so much healthier, useing the glass popcorn popper rather than all the chemicals, etc, in the bags of microwave popcorn. Popcorn is healthy, and so is butter in moderation. We have owned one of these popcorn poppers for almost a year. 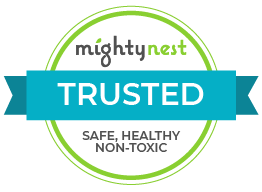 We are so happy with it that prior to making a trip to see our kids and grandkids in Olympia, Washington for thanksgiving, we ordered one to be shipped directly to them from Mighty Nest. When we arrived in Olympia the day before Thanksgiving, we discovered that our kids had just received the package the day before. Since our kids and grandkids had enjoyed the popcorn we popped at our house in California in the summer, they were excited to have a popper of their own. During our visit, we used it a couple of times. Like us, they are very happy with this popper especially since you can control how much butter and how much salt, etc. you use and there are no preservatives as in microwave popcorn. Shopping at Mighty Nest was a breeze - everyone is happy with this product. A great gift for my daughter who is always eating healthy. Just what we needed. A quick easy way to make a healthy snack. My boys use it every night! A great, fast, easy to clean alternative to making popcorn on the stove! Particularly useful for someone like me who has a tendency to start the popcorn and then start another project only to find popcorn burning on the stove! Does require careful handling (especially with the handle itself) but it is glass, so that's to be expected. I love this popper. It does have a tendency to leave some unpopped kernels, but I'm playing around with microwave times and power levels to hopefully cut down some on that. What does pop is light and crunchy and so much better than with an air popper, or even stove-popped, which is too oily for me. I give the kernels a light spritz of olive oil spray before microwaving just to give it a little extra flavor and recently started adding my salt/salt substitute before popping, which helps it stick better. Let me first say the customer service at Mighty Nest is outstanding...five star. I ordered (several) of the Catamount poppers each of them broke at the handle. Finally, I called customer service and realized through that conversation there was a design flaw in the larger size as many customrs were experiencing the same disappointment with the product. Amy Riseborough was fabulous and suggested we try the smaller version without the handle. Love it! We use it every single night. Crunchy delicious and healthy. Easy clean-up. No worries about breaking. I have sent many friends to your sight and will continue to do so. I really love how green this set up is. Everything washes easily in the dishwasher, and no plastic! The only downside is that it doesn't make very much popcorn at a time. Enough for one person. And it takes my microwave about 3 minutes to pop 1/4 cup kernels. So to make enough for a family of 4 will take you about 12 minutes. So glad I finally bought this! Like another reviewer, we have a smallish microwave so I had to take the turntable out to make it fit, but it doesn't appear to have any negative effect. The handle does seem a bit fragile, but it says right on it that you should grab it by both the handle and the bottom, so I'm sure it will be OK. I've only used it a few times and have been disappointed. I put in 2 oz. of popcorn and butter on top. Fortunately, we have a rather large microwave because it just fits. We didn't get a lot of popcorn and we had a LOT of unpopped kernels left over. I will continue to adjust amounts of popcorn and cooking time, as well as adding butter at the end (good idea!). I haven't given up yet! I really wanted to like this, but it's so big. It is awkward to store - practically takes up an entire shelf in my cupboards and I just didn't think it worked well enough to want to keep it. I loved the idea of this popper for the convenience of microwave without the chemicals and packaging. Unfortunately, it didn't really meet my expectations. If I follow directions and add 1/4 cup popcorn, it only half fills the popper. If I put in more corn, it burns before it's done popping. I have a fairly new and standard 1100 watt microwave and bought new popcorn. Also, I was disappointed in the butter-melt lid. Even putting 2 tablespoons of (real) butter on the lid I couldn't taste it on the small batch that 1/4 cup corn makes. It seemed to all end up on the walls of the popper. If I keep using the popper, I'll just melt the butter separately and pour it on after popping. Thought the idea was great however, we only used it once because it doesn't fit well in our microwave unless we take out the turn table. We will have to give it another go! We will give this one more try, but definitely disappointed. We were watching and listening, but still ended up with mostly burned popcorn, very little butter flavor on the good kernels and the lid actually seems to have melted in one section. Next time we will do less time and/or reduce the power to see if it works. Stop popping in easy, too and fun for the kids when the lid gets pushed up. We will most likely be sticking to that. If it ain't broke, don't fix it. Thanks for your review! The glass popper can definitely take a bit of trial and error to achieve the perfect light fluffy popcorn. Our customer service team will be reaching out directly to give you some tips that may help. When I use this, it barely pops any of the kernels. It seems like a great idea but doesn't work well in my microwave.